The second season opened with a lovely little trailer of what we can expect this time around. It takes place six months after Amon’s defeat, with Korra knowing the basics of air bending. Now she has to travel to the world’s air temples to master her bending to become a full-on Avatar. But while taking a pit-stop at the Southern Water Tribe for a festival, things go haywire with the spiritual world. So Korra follows her uncle, Unalaq, on a journey to fix the spirit world that didn’t get enough attention after the Hundred Years War. Korra basically breaks up with Tenzin, saying their time is up, and he takes his family (including Uncle Bumi and Aunt Kya) on vacation to the Air Temples. So far, what we can tell from this show is there’s going to be three things: 1. A lot of Mako and Korra fighting. (When is there not) 2. A lot of Jinora. (Which I am so pumped about). And 3. A lot of getting to know everybody’s families better. (Except Mako and Bolin. Oh god it’s like a sick, Batman orphan joke). All in all, I’m really impressed by the idea of an entire season dedicated to the spirit world. It’s something that was never explored in ATLA and they could go somewhere awesome with it. That’s the reason I love TLOK. It doesn’t show up ATLA, or go through the same plot line with a new Avatar, but it builds off what we saw before, and broadens our knowledge of their world. As for the season premier, it’s an A in my book. Note: I didn’t like the look of those ships sailing in during the last few minutes. Does it seem too “Fire Nation War Ship” to anyone else? 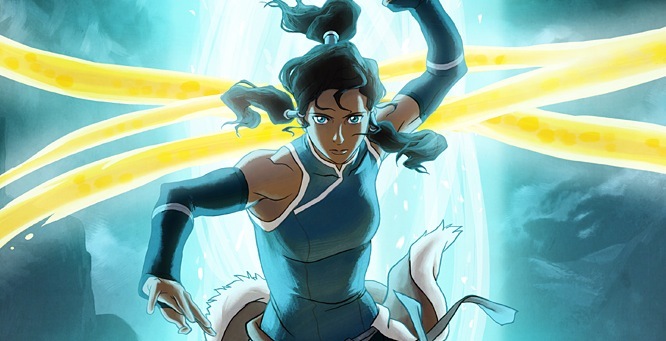 Also, The picture of the promo poster was snagged and cropped from LOK co-creator Bryan Konietzko’s tumblr. You can find the original post here.